What?!?! 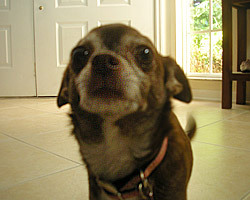 I might be getting a new Chihuahua “seeester”? My Mama snuck off for a couple of days. Not that I can blame or resent her much – she went to visit our girl away at college. Our princess is studying and working hard to become a ballerina and she was performing in her first professional capacity as a guest artist with the Kansas City Ballet in Giselle. Mom says she was phenomenal and the critics agreed!! Anyhow, I am getting somewhere with this story. Do you remember the story about Noel – the little chihuahua that had been abandoned or lost by the side of the road in the middle of the harsh K.C. winter? She had been so exposed to the harsh cold that we did not know if she’d recover. Well, we have an update!! THEN, and this is where it gets interesting, when summer break comes, everyone is hoping Noel can come home with our girl and stay with us in Florida. Heh, heh, that of course would require cooperation from yours truly. So we are all preparing for a “test drive” in May. We have a big family get together planned here in St. Petersburg, so Aye is bringing all the K.C. Chihuahuas to visit. I get to see my seeeesters, which will be loads of fun. But I also get to meet my new part-time sissy, Noel. Grrrrrrr! 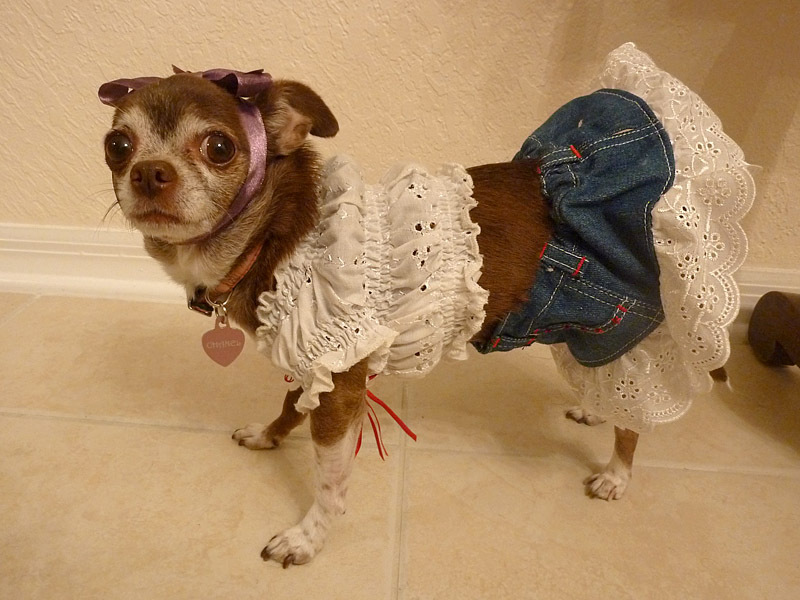 This makes the Chihuahua muy angry!!! To the “human” and I use that term way tooooo loosely here: What were you thinking?!?!? The puppy tried to chase after your car. It could have been run over. It is winter, and a horrible winter season at that. What if someone had NOT been able to catch the puppy?!?!?! The fact that you chose a public place I hope means that you were “thinking” that someone would find the puppy. That is all I can give you. What happened to the “humane” part of being human. Though this is something I’d dispute, isn’t that what separates humans from the beasts. I’m glad this is considered a crime in your area. I do hope you are found and brought to justice. THERE are soooooooo many alternatives. I don’t care how desperate you were. There is NO excuse for this. 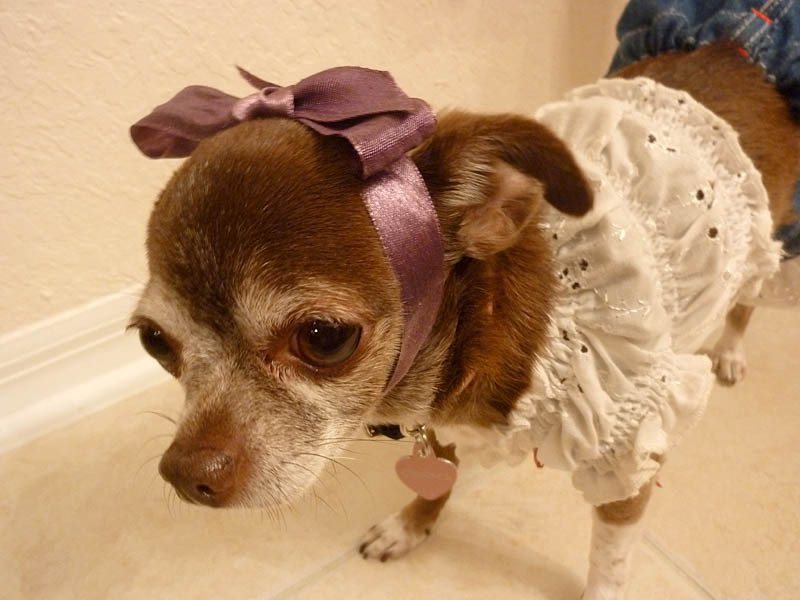 I guess I’m extra irked because my gramma has been helping in the care of another little Chihuahua that was abandoned in a similar situation in Kansas City. A little fluff of no more than 3-lb. Chihuahua was spotted in a ditch by a highway nearly frozen to death. It is a miracle that someone spotted a little movement and stopped to investigate. She was emaciated and very week, and her beautiful lustrous eyes were in dire straights as her tear ducts had dried from the exposure. A kind soul rushed her to another kid soul, a vet, who volunteered his services and performed the necessary surgery to save her vision. My gramma reports that she is in a kind foster home, right across the street from her. She has been helping minister the eye drops she now needs on a daily basis. But the sweet little NOEL, as she has been named because of the season during which she was rescued, has proven to be a truly gentle and loving soul. Grateful and loving to all of those who are taking care of her. She has put on some weight in her recovery and her lovely long coat is filling back in nicely. PEOPLE, PLEASE!!!!!!! If you need help, FIND help!! There are soooooo many rescue groups, no-kill shelters, agencies and services out there. If you can no longer care for a pet, please don’t do anything desperate. Anipals, on this Saturday Pet Blogger Hop, let’s help spread the word and the prayers that this kind of cruelty stop!! You may have seen the gorilla in the UK who seems perfectly comfortable walking upright like a human. One news report even got cute with the video and put together a nice little sequence to the “Walks like a Man” tune by Franky Valli. Apparently, This gorilla’s mother and father used to stand and walk as well, though not as well as Ambam does. And though he is the biggest in his group, apparently he does not go about bullying or proving his superiority. If you haven’t seen him, check out the story of Ambam, an endangered Western lowland gorilla on CBSNews. Animals will never cease to amaze us. Now if we (the humans) get a little smarter, perhaps we can help some animals in dire need of a chance to prove their smarts and their worth. I got a message on my Facebook profile from a group, aheartandhand.org, that has set out to help shelter dogs by training them to become service animals. Being trained will allow these perfectly lovable dogs “to help people with disabilities and give both person and dog a second chance at life.” I couldn’t agree more. PAWSOMEST IDEA EVER!!!! So please support this cause by going to the Facebook page, “liking” their cause and perhaps taking the pledge to invite your friends that share your love for dogs. It seems to me this notion is more than worth a try. I’d love to see this training program catch on like wildfire in shelters across the nation. Let’s help spread the word for the cause!! Oh, oh, and Happy Saturday Blog Hop!!! Sign up and pass on some pet wisdom!! Share your pictures on my wall on Facebook. I can’t wait to see you in full sweetness and cuteness. Mom and I did spend some quality time today, even if I could not sit directly on her lap because she was on her laptop. But on this rainy wet “weekend” morning, we definitely cuddled and gave thanks for each other as we browsed the internet and found these amazing pet adoption stories. A great way to start a good week. 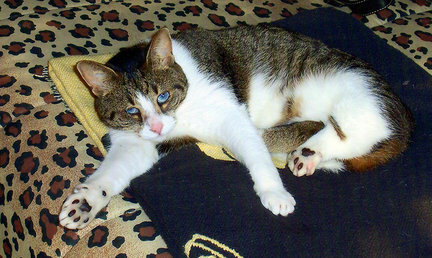 From the Cleveland Sun Post-Herald’s Picture Perfect Pets we read the amazing story about Bunny the Kitty. This beautiful Kitty beat the odds in so many ways. And she is not letting anything stop her (except maybe the nasty vacuum cleaner, and I totally get that!) from living a full life now blessed with loving parents. Bunny, you are an inspiring chica!! And then there was an update from dallasnews.com about the real life Homeward Bound story of a great dane, a goat and a three-legged retriever! I missed the first stories, but apparently, the inseparable trio did not only have the problem of being runaways trying to survive in a suburban area, but the Sheriff got into it citing some law that threatened to separate the dogs from their beloved goat because she was considered livestock! How dare he be so insensitive?!?!?! I almost choked on my Cheerios snacks when we got to that part. But the good folks from those part and a city commissioner got involved and they worked it out legally so all they could be kept on foster care and rehabilitated to be ready for adoption. And the stipulation for prospective new owners includes that Minelli, the goat now considered a pet, and her beloved dog pals, Judy and Lucky be adopted together! Come on now, the Sheriff should have known these three had something special going on when they were found wandering around the Alexander Mansion wedding chapel in Garland!! Amigos, I just had to share some happy, feel good news. In a world where so many stray and abandoned pets do not get so lucky, we must celebrate every little miracle story and pray for more! Let’s look out for one another. 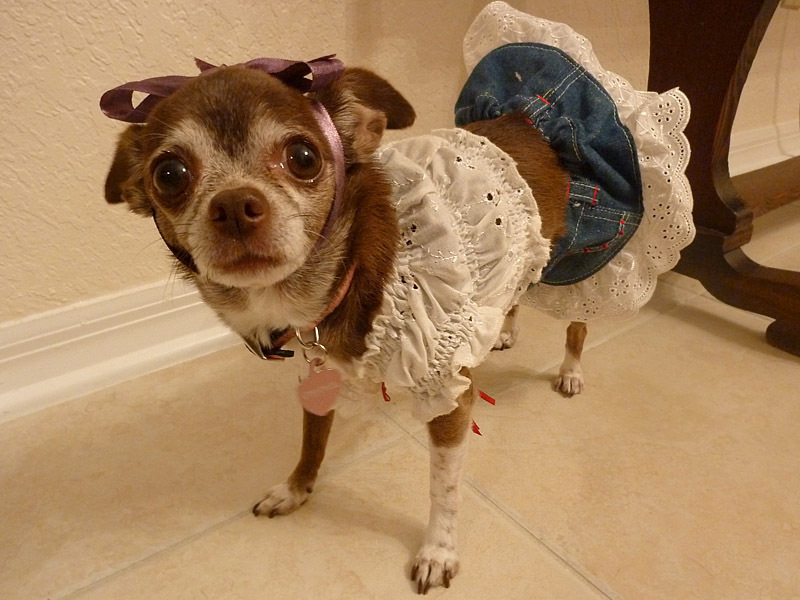 You are currently browsing entries tagged with Pet adoption at Chihuahua Wisdom Blog.